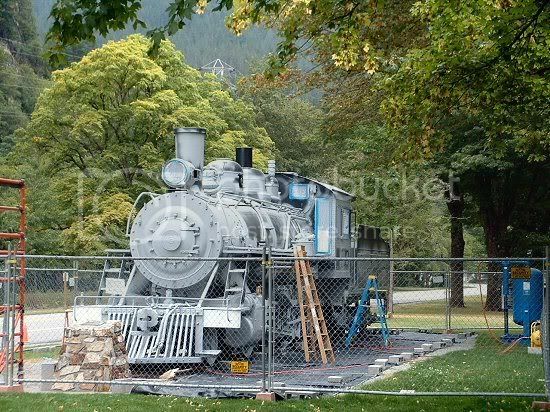 One of the first things to greet you at the visitor center is Old Number 6, the original train that, in its day, made the trip up to the dam construction sites several times a day for over a decade. It's currently under renovations, as one might surmise by the fence... and the primer. 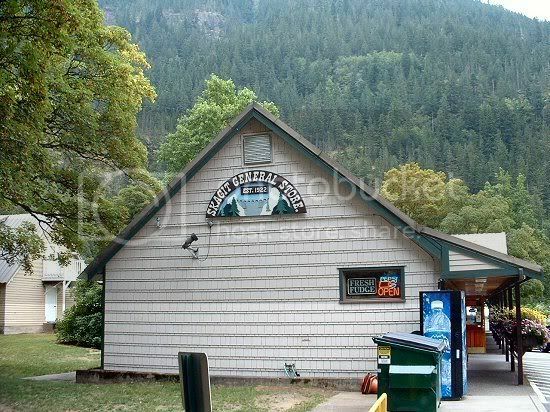 The original Seattle Light company store still operates today, providing tourists and locals alike with junk food, tourist items, and other essentials. And fudge. They have some nice fudge in many flavors. And why did they build so far up in the hills? Why, to take advantage of alien technology left by a UFO crash, as witnessed here. 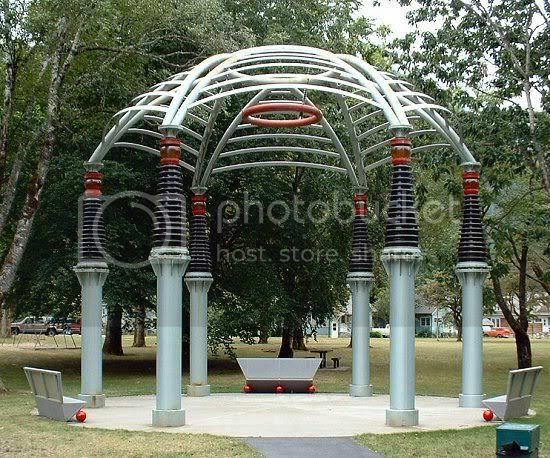 This gazebo claims to use obsolete parts from the power stations, but no sci-fi buff will be fooled. 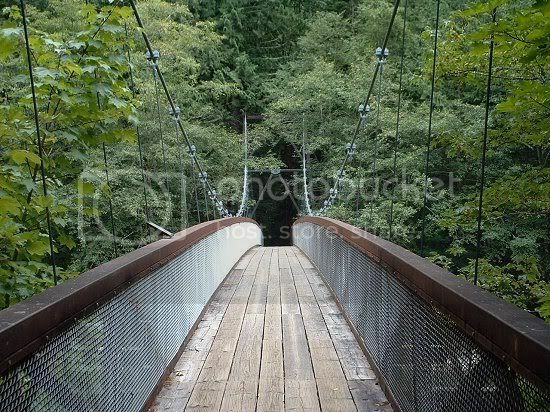 The Trail of Cedars is a 1-mile loop across the Skagit River. 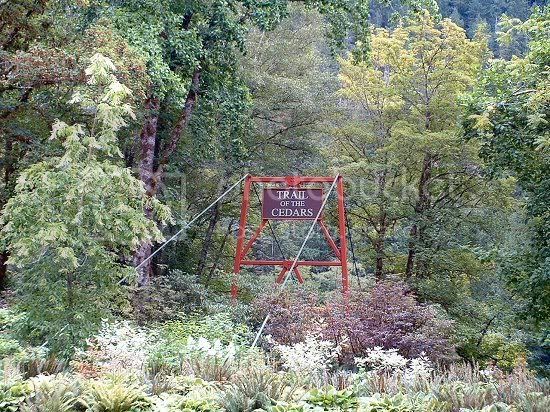 It goes by, oddly enough, lots of cedars... or Western red cedars, I expect, as we don't have true cedars in this part of the country. Unfortunately, I didn't get a chance to explore because we had to wait for the tour, and by the time we got back Grandpa was ready to go home. No, I have not manipulated the water color. 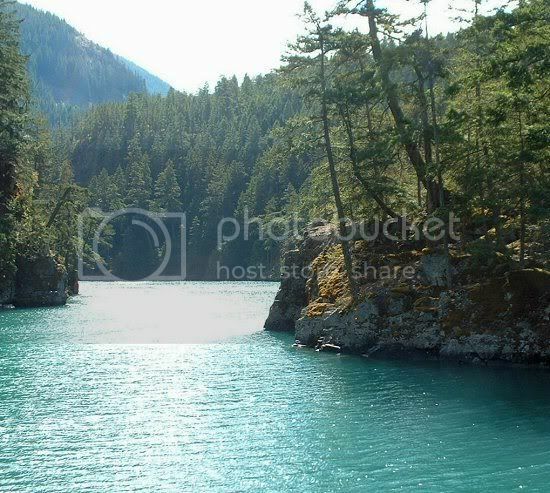 Due to deposits of gniess (a rock related to granite), the waters of the Skagit run nearly opaque bluish-green. 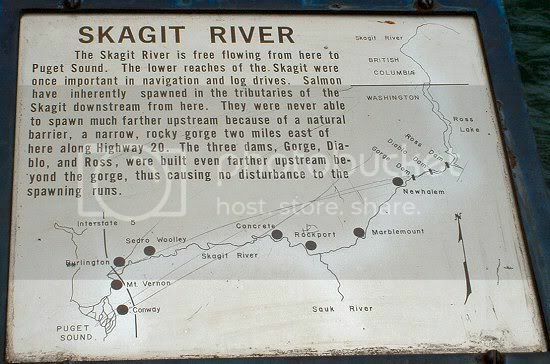 Yes, I know you were dying for a map of the Skagit River. And, yes, we're that close to the Canadian border at this point. 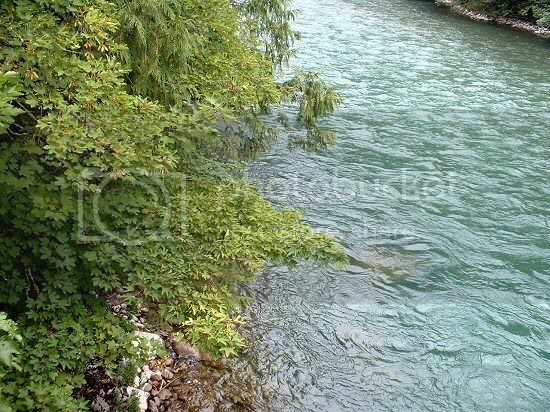 I suppose technically these are partially Canadian waters... some of the water comes from glaciers north of the border. Note Newhalem, which is actually where I was at that very moment. 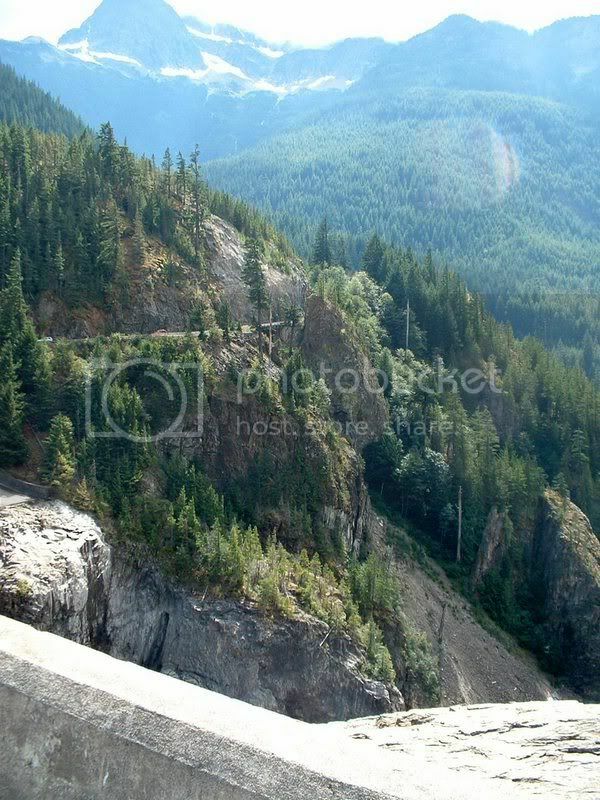 I really, really wish the tour bus from the visitor center had stopped now and again, but you probably don't - I missed a zillion chances to ruin the beauty of the North Cascades at scenic overlooks. 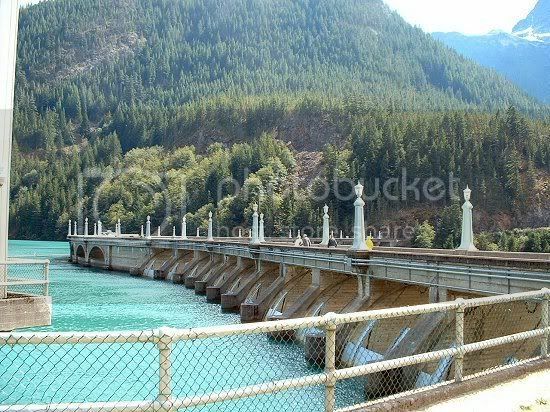 But, anyway, a vaguely informative bus ride took us to our destination: Diablo Lake, above the Diablo Dam, and the Alice Ross III - which we had to drive across the dam to reach. 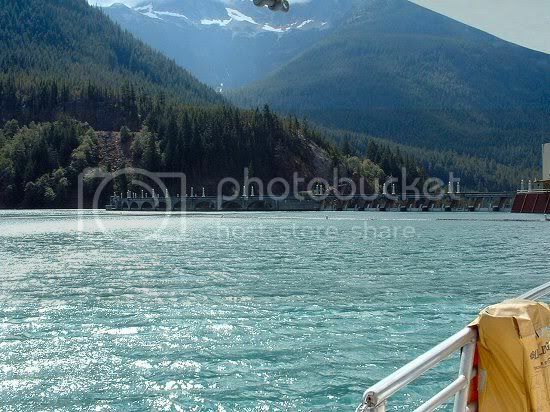 The ship actually had to be cut in half - top and bottom - to fit through the tunnels on the North Cascades Highway. Fortunately, it had been reassembled by the time we got to it. 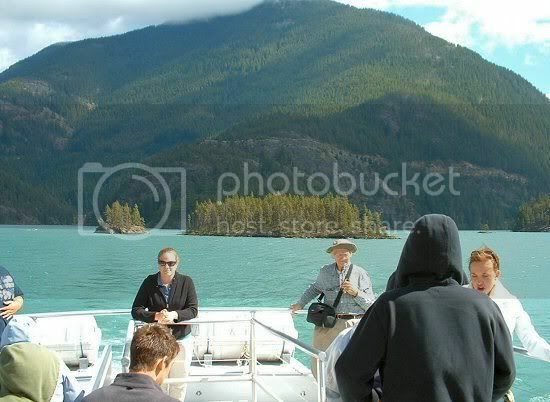 We'll get back to the dam in a bit... for now, we're off on the lake. The peaks around here had a number of colorful names: Colonial Peak, Sourdough Mountain, Pyramid Peak, Paul Bunyan Peak... unfortunately, I couldn't pick out which was which from the boat narrative, but this one I did ID. I think. 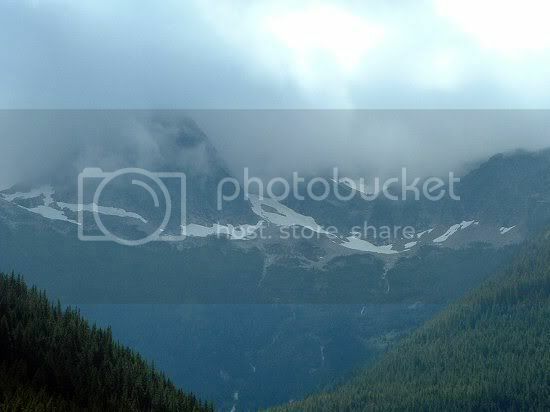 Anyways, it's a pretty mountain which I don't remotely do justice to. 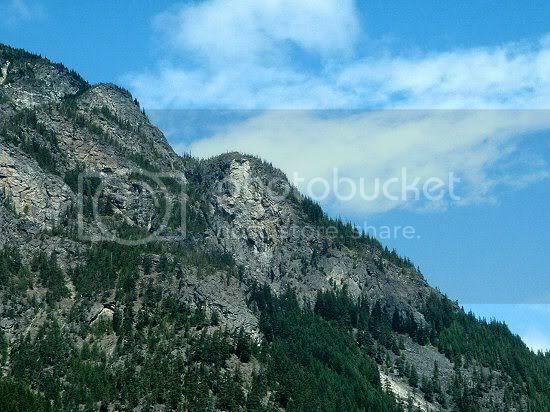 But, then, I didn't see a single ugly mountain in my trip. 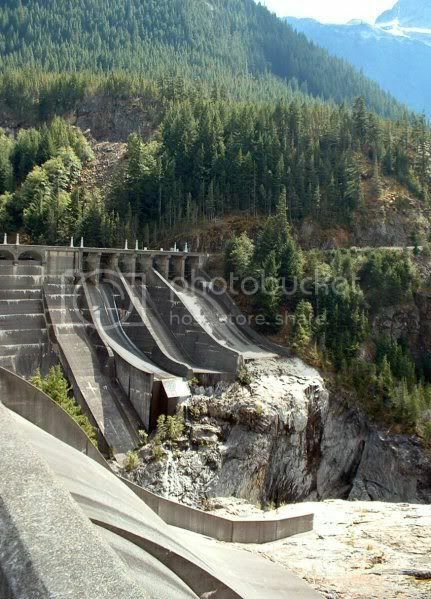 The lake narrows as you head up to the highest (last) dam in the Seattle Light network, Ross Dam. 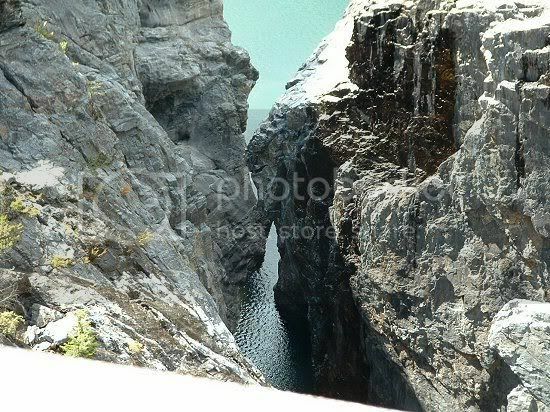 This picture is actually from the return trip, but it shows how narrow it gets. End of the line for this lake, beginning of the next one... The pattern on the dam was intended to help adhere subsequent layers of concrete. At one time, plans called for another hundred-odd feet to be added, but that would've flooded more American and Canadian land, and in the 1960's they finally started figuring out that there was value in wilderness areas. 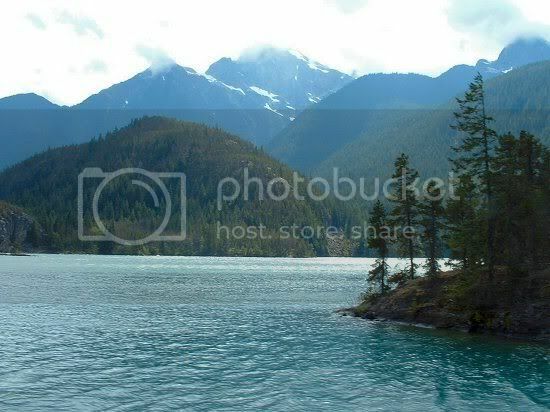 As it is, Ross Lake already pokes beyond the border, and is evidently quite a sight. 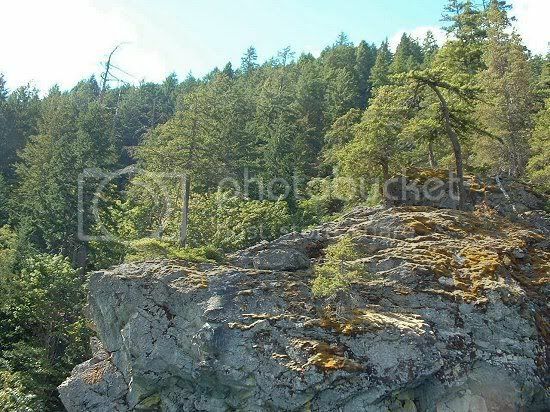 From the return trip, though we saw them on the way up. Deer Island, the bigger one on the right, was named because local deer used to swim out there to give birth to their fawns, who would return to the mainland after some predator-free growing time. 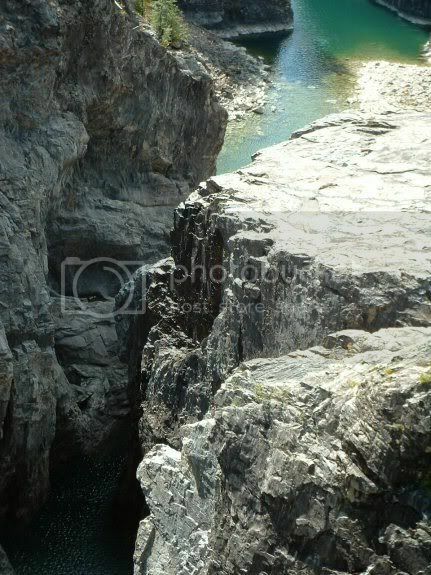 (I don't know if they do this anymore, though it is still a fairly remote area - there are even two boat-in-only camping places with not even a foot trail connecting them to the outside world.) Monkey Island, the little guy on the left, was so named because one of the great minds behind the project, Mr. Ross himself, would have monkeys shipped up from Seattle's Woodland Park Zoo in the summer and placed on the island for the tourists to oooh and aahh over; the zookeeper would then have to round them all up and take them to mainland sleeping facilities, to be rereleased the next day until the end of the season. 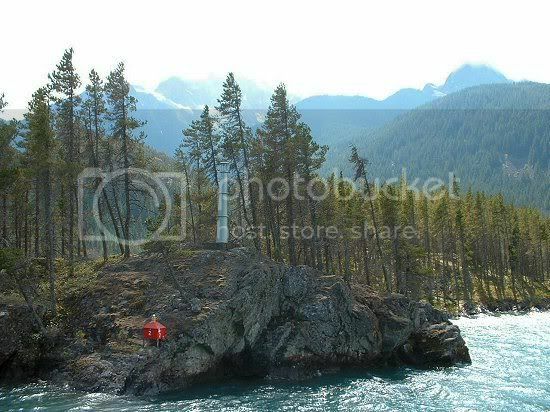 A little lighthouse to help ships navigate the rocky waters of the lake in all weathers. 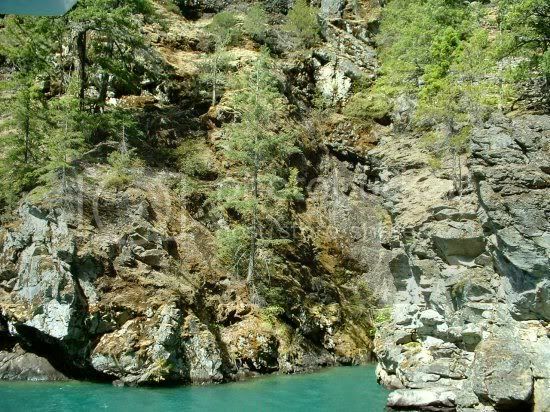 There are actually trees down under the water still, from the valley's flooding; one enterprising dam worker tried to harvest the salable lumber, presumably with home-rigged equipment, and paid for his greed with his life. Since he was the only recorded death on the Diablo Dam project, he got a plaque on the dam to immortalize his capitalistic stupidity. 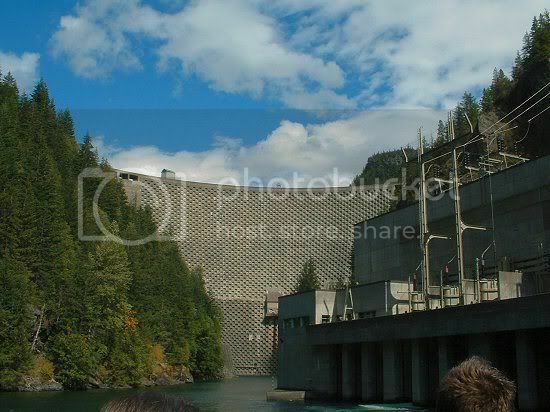 After the boat ride, we headed back across Diablo Dam... on foot. 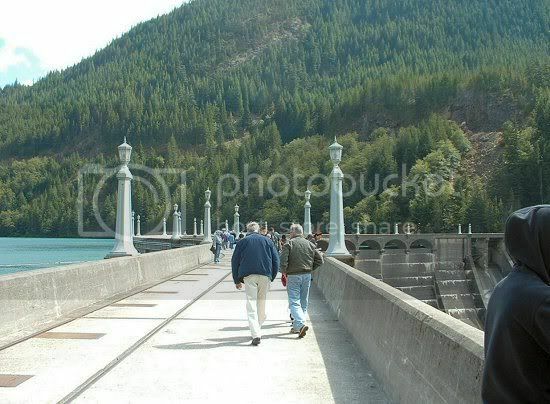 Yes, we had the option of crossing Diablo Dam on foot for the return trip. Grandpa opted out, as did Dad, but my aunt, my mother, and myself figured we'd regret it if we didn't try. Boy, that's a long way down... consider that the water is roughly 350 feet deep on the lake side of the dam, and you get an idea of the dropoff on the spillway side. It's a looong way down... and you didn't have to tell me twice not to lean. 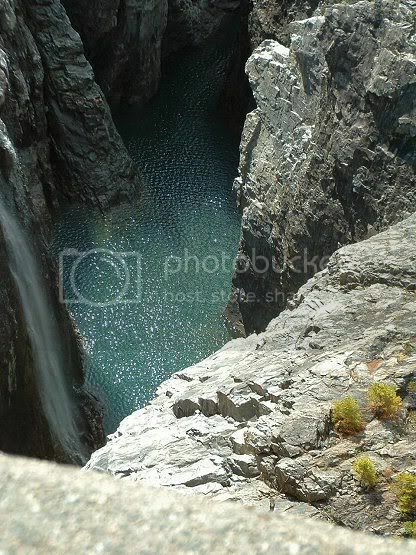 The spillway on the far side. Yes, I had to... Fortunately, that's the last of them. I have many, many more pictures, and many, many, many more that I'd wished I'd taken, but I think you've suffered enough for now. Anyway, it was a long day, and a tiring drive, but I'm happy I had the chance to go. For all none of you who care, Phase 2 of my site overhaul officially hit the Internet today. The Skyhaven Hunt, down since March (as part of Operation Machete Phase 1), has returned. It was supposed to be back in May... which became June... then July... but finally, in August, I managed to scrape together a redesigned Hunt. It shouldn't take more than half an hour to get through, all told, but I have Big Plans for the Future. As usual. The debut of the Hunt is one more checkmark on my list from January (the twelve things I wanted to accomplish this year), and most of the way to a second one (one more new Skyhaven critter to go on #10.) Unfortunately, it's about the only progress I can report on the list since February, and I've pretty much blown any chance of accomplishing two of them. As usual, I represent my own biggest obstacle to achieving anything. So, I've revamped Skyhaven Adoptions and the Skyhaven Hunt. Is this the end of Operation Machete? No - unfortunately for you, it's not. I still have to start work on Phase 3: the reintroduction of the jewelwings. Considering how devious I like to be in hiding them, it constitutes a phase all on its own. Hopefully by 2008 I'll be done with that part... just in time to consider revamping again.